It occurs to me that I might have found the secret formula for getting kids to read. While the media and teachers complain that kids don’t read anymore, I can’t get my kids to stop. Even Lucia, who is too young to read, is a voracious reader. I jokingly yell at Eve (age 12), “How many times do I have to tell you to STOP reading!” She would read while walking and eating if we would let her. And not only is Maya (age 27) a published romance novelist, but she’s about to get her master’s degree in literary history, and has read the works of Proust…all of them. 1. Be a reading role model. Thanks to mirror neurons in the human brain, our kids will mimic whatever we do. So if we spend a lot of time reading, they will spend a lot of time reading. 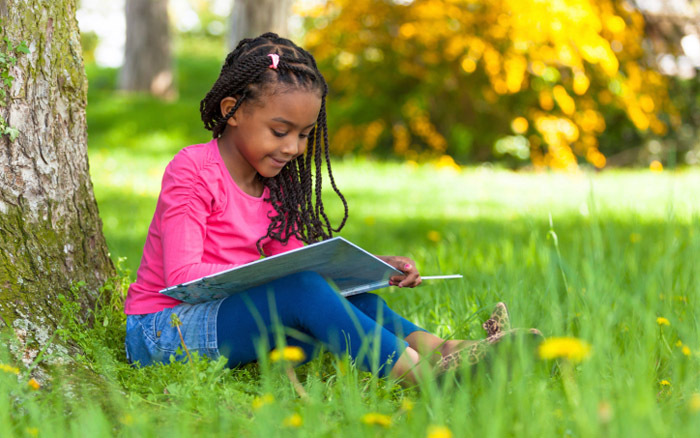 It doesn’t matter whether it’s People magazine, romance novels, or literary fiction—the act of reading in front of our kids makes them want to read. So if you want your kids to read, read in front of them. Read newspapers, magazines, books, and cereal boxes. 2. Buy books like candy. When we go food shopping, we always end up in the book and magazine aisle (in fact, that is our “home base” if anyone gets lost). It’s our “reward” for completing our chore. Everyone gets to buy a book or a magazine, and I don’t judge too harshly what anyone picks. For the little one, it keeps her occupied during the checkout process. If Eve can’t find a good book since she has read all of them already, I let her buy those teen celebrity magazines—after all, we are in the magazine business, and I want to encourage future magazine readers! But a fresh, new book is just as exciting as a candy bar, is much better for you, and lasts a hell of a lot longer. 3. Indulge their pleasures. My husband isn’t a big reader—unless it comes to sports stuff. It’s not my cup of tea, but if that’s what gets him reading, then I’m all for it. Eve has read the whole Twilight series—I think about nine times. That’s OK with me. Lucia likes Thomas the Tank Engine, even though she’s a girl. But she also loves the Disney Princesses. The great thing about books is that there is something for everyone, and for every pleasure. Anytime people use book preferences to pass moral judgment, I get angry…the whole idea that certain books are good and others are bad—or that people should only read “literary” books—is what gives reading a bad name all together. 4. Read aloud. Lou has always read to Eve before bed—they’ve done Narnia and The Hobbit—and he has ultimate patience reading to Lucia, over and over. My favorite read-aloud story is from a time when Eve came down with pneumonia. One of my favorite books growing up was the Little House on the Prairie series. I was devastated that Maya never wanted to read them, and Eve was showing no desire to read them either. So, while she was captive in bed, I read Eve the first book out loud. Not only was it fun for me—I had forgotten how funny and interesting the story was—but Eve was hooked, too. By the time she went back to school, she had read the whole series. Recently, on a long car trip, I read aloud some of the diary of Alexander von Humboldt’s journey to South America in the early 1800s. It was utterly remarkable how modern his voice sounded, and how fascinating his insights were. I knew no one else would ever read it on their own, but by reading it aloud to a captive audience, I got to share a little bit of my pleasure with them. 5. Make them come alive. We have been to Louisa May Alcott’s house in Concord, Massachusetts, twice, and have swum in Walden Pond. Next summer we are visiting the Laura Ingalls Wilder homestead museum in Iowa. I’ve dragged my whole family to Lady Murasaki’s 1,000-year-old home on a backstreet in Kyoto, Japan, to see the Tale of Genji world she created in the first novel ever written. Maya and I and a dear friend of mine went on a trip to England and visited some of our favorite sites from Regency romance novels. If there is a movie or documentary about a writer, or a favorite book, we watch it, and probably much to the annoyance of my family, I talk about it. (I tried to force my kids to watch the Botany of Desire documentary on PBS, but only Lucia stayed awake for the whole thing). We visit historical sites that we have read about (for Lou, that involves sports stadiums—thankfully, he has other friends he takes with him). Reading makes the world come alive in your head in a whole new way. Anytime that can be reinforced with real-life experience, it’s a great thing. 6. Have reading parties in bed. Speaking of great things…I love to read in bed. I get cranky when my kids want to stay up and all I want to do is go to bed and read. So I came up with the idea of having reading parties in bed. They LOVE it. We all get in our pajamas and brush our teeth and then meet in my big bed to read until we can’t keep our eyes open anymore. Then, it’s a much easier process to get them from my bed into theirs without a fuss. We don’t do it every night, so it keeps it special, but we do it at least once a week, and I have never, ever, heard either of them say they didn’t want to come to a reading party in my bed…but sorry, only my girls are invited! Both my parents read to me for hours every week until I was well into elementary school and I have been a voracious reader ever since (though I still hanker to have things read to me while I’m doing other things, for which audio books are the perfect answer). While I didn’t have the leisure to read out loud as much to my kids when they were young, both of them have also become voracious readers. My budget has not always stretched to buying new books, but the kids were always thrilled to get a trip to the used book store or the library to pick up a stack of their own choosing for the next few weeks. Libraries and used book stores are great, Green options to buying everything new. I read 4 to 6 books on tape a week while driving and doing chores, and all too frequently seem to keep at least one longer than I should, racking up an overdue fine — which I accept as my “donation” to help keep my favorite public libraries open and stocked. They need our support more than ever right now, as State funding cuts (at least here in PA) have slashed operating budgets. As I love to read before bedtime, we’ve always had ‘reading parties’. I tell my 7-year-old son to go grab a book and come cuddle and read with mom. He also gets read to and has already been introduced to LOTR and Treasure Island, as well as some other classics. As he’s surrounded by books (our home looks like a library) and both parents love to read, we’re hoping he shares that love as well as he grows up. I was deeply involved in an early learning project in the early 70s and learned that the most important thing a father can do for his children is to read to them–from the time they are born, or even before. Mom reading is important, to be sure, but there’s just no limit to the impact of seeing and hearing Dad read to them. It doesn’t even matter what he’s reading, could be a newspaper, magazine, a book, or even the ingredients statement from a can of paint. It cements the bonding process and creates a very strong positive image in their minds. My husband read to all our children and they are all avid readers today. All three of them read long before they started school and if they got “too quiet” in the other room, I could always find them curled up with a book in an out-of-the-way place. Books will never betray me! That’s my new motto! Fantastic! As a child I was not read to much by my parents. I had six older siblings that took on that task. So when I had my own first child I read to her constantly, sometimes for hours. With the second child I didn’t have as much time. By the third child the oldest took on the role of resident librarian in our house and did the reading to the younger ones. Even taking them to the library with the stroller when she got old enough. Now with the oldest in Sudan and the youngest in high school we all fondly recall those days. The middle one is planning a family now and it is especially important to her to space them apart for the same reasons! I admit to having reading parties to this day when they come home. Ummm, Taggart is reading a Pokemon chapter book right now, so after reading this post, I’m okay with that. As book lovers, management of our inventory is a big issue. Fortunately, our library has a used bookstore within that we donate to and replenish with. I’m reading Peace Like a River currently-fabulous and strongly recommend. We lived with my grandparents when I was very young. My grandmother read to me for practice with her new teeth. I learned to read before I went to school and have been reading ever since. My parents are both readers. My husband is also a reader. We both read to our children when they were young. We didn’t even have a tv for about 5 years – no reception in the mountains where we lived. We made twice weekly trips to the library. That’s also when we read the Little House series aloud. Even after we moved to tv reception land, it wasn’t unusual to see all four of us sitting with our noses in books while the tv made background noise. We never censored the kids’ reading only told them that when they didn’t understand something to ask for help or if they came across an unfamiliar word to look it up on one of our several dictionaries. They are both voracious readers. I also gift new babies with books. Aaah books. I wouldn’t be here today without them. I grew up in a scary household but the one great gift the very dysfunctional grown-ups who raised me gave was the gift of reading. Where they couldn’t parent or inspire they gave me a window to worlds of love, understanding, wisdom, education and adventure without which despair and ignorance would have governed my formative years. To all those who write, thank you!